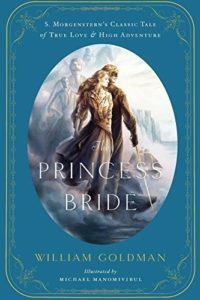 The Princess Bride is just as delightful in book form as it is in movie form (or vice versa, depending on which you’ve already experienced!). The Princess Bride: S. Morgenstern’s Classic Tale of True Love and High Adventure by William Goldman. 1973. The Princess Bride book was published in the 1970s, and it purports to be an edited, abridged version of a much older story by one “S. Morgenstern.” Morgenstern is, of course, fictitious, but the frame tale adds much to the timeless feel of this high adventure complete with pirates, true love, nefarious villains, and a Medieval-esque cohort of eccentrics. The Princess Bride film hit screens in the 1980s and became a cult favorite. Quotable lines, quirky characters, love and adventure, and a melodramatic soundtrack make the movie just as enjoyable on a re-watch as it is the first time around. But how many fans of the movie have read the book? Buttercup awakens one day to realize the farm boy, Westley, is in love with her and, even more shocking, she is in love with him. Westley leaves to seek his fortune, is captured by the Dread Pirate Roberts, and presumed dead. Buttercup agrees to marry Prince Humperdinck although she warns him she will never love him. Humperdinck hires some mercenaries to kidnap the future princess and kill her; they are to lay the blame for this on the neighboring enemy kingdom of Gilder. Westley, as “the man in black,” manages to rescue Buttercup, but is himself captured by Humperdinck, who sends him to the Zoo of Death (book)/Pit of Despair (movie). The giant and Spaniard (bested by Westley earlier) now return to rescue Westley. Together, the three storm the castle, save the Princess, wreak revenge for the Spaniard’s father’s death, and evade Prince Humperdinck. The film version is full of hilarious quips, genuinely funny characters, and a rather campy approach to violence. The book version contains these same elements, but more descriptive details (such as in the Zoo of Death), the lack of a melodramatic soundtrack, and more back story (such as the Spaniard’s father’s death) contribute to a more intense experience. (Goldman helped with the film adaptation, so it’s safe to assume the humorous tone is what he meant in the book as well.) If children have seen the movie, they will be fine with the book. But if you have sensitive children who haven’t seen the movie, it might be better to wait until age 10 or so. For other romance/adventure tales with a classic feel, check out The Lost World, Isle of Blood and Stone, The Traitor’s Game, and The Thief.